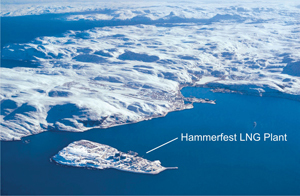 The Hammerfest Liquefied Natural Gas (LNG) Plant is the world’s northernmost LNG plant, in remote northern Norway, 300 miles north of the Arctic Circle. According to some sources, the Arctic region probably holds 25 percent of the planet’s undiscovered hydrocarbon reserves. The plant owner, StatoilHydro, commissioned the project. The contractor, a joint venture between Aker Kvaerner and KAEFER Group, carried out the hook-up and installation work in one of the world’s most challenging oil and gas development projects. The installation work on site took 3 years, involving 3,000 workers putting in 5.4 million hours to get the plant ready for operation. Hammerfest was a “green” project, with all CO2 pumped back to the gas field of SnØhvit. Norway is a reliable energy provider, and StatoilHydro has entered into contracts with American companies for a 20-year period. 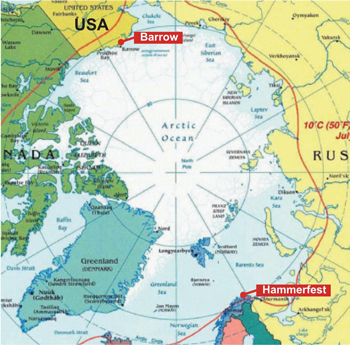 LNG will be shipped from the Arctic plant in Hammerfest to an LNG terminal at Cove Point, Maryland, on the U.S. East Coast. Many companies bid on the on-site installation for the Hammerfest plant, which was scheduled to take about 2 years but actually took 3 years. The final cost was $600 million for insulation, passive fireproofing, surface protection, and weather protection. There were many challenges to overcome. First, the area where the plant was to be built is exposed to extreme weather. Second, there was a total lack of infrastructure and logistics. This was uncharted territory: the first time an entire LNG plant had to be built in modules and large units and then transported by sea to the plant site, several thousand miles from the production workshops. The key to success lay in creating a controlled working environment. Our part of the job was to insulate the entire plant, for applications ranging from high-temperature to cryogenic. We began by enclosing all the workplaces, concentrating on factors that were important to the working environment, such as the structure and a focus on safety. The entire plant was constructed in various locations all over Europe and then transported by sea to Hammerfest. Nobody had seen a jigsaw puzzle like this before, because no offshore gas field has ever been developed this far north. The LNG plant in Hammerfest is certainly the world’s northernmost and probably the one most exposed to extreme weather. The LNG plant was prefabricated far south in Europe, an entirely appropriate process for a project facing such unusual conditions. New ways of construction had to be developed to accommodate the lack of local building capacity and infrastructure, as well as the local climatic conditions. Throughout the process, the operative question was how to put this puzzle together. For example, the heart of the plant was built in Cadiz, Spain, and had to be transported by sea. With the weather conditions on site, however, there was only a 3-month weather window for sea transport. Because transporting the modules had to be done within the weather window, the job of piecing everything together was much greater and much more complicated for the Aker Kvaerner/KAEFER Group than is typical. The modules and the process plant arrived in a far less completed state than anticipated when the contract was signed. In addition, because parts of the facility were made at a number of locations throughout Europe, quantity variations and quality deviations existed. Bad weather at sea also caused damage to the modules that was only detected upon arrival at the site. 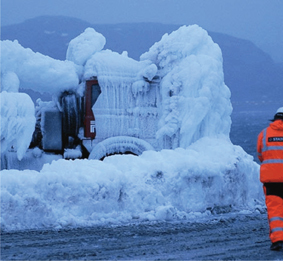 The biggest challenges came from the site itself: How would personnel be able to work in such extreme weather conditions? How could the site be prepared so that up to 3,000 people could work there? How would employees—and management—get physically and mentally prepared for the job? 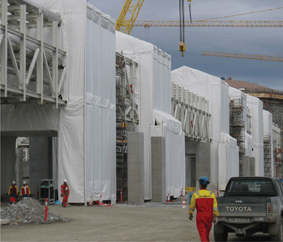 To ensure good working conditions, a total area of approximately 3.2 million square feet was enclosed under temporary fabric structures. These houses stood up to the weather for 3 years without a single tear. 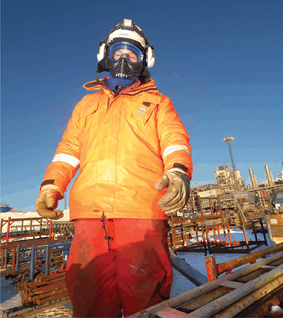 Aker Kvaerner/KAEFER Group focused on health and safety. Throughout the construction project, they wanted every single one of their employees to feel safe. Before the work started, they prepared their workers for what lay ahead: 3 weeks of working 10-hour days, followed by 2 weeks off. They chartered their own aircraft to handle personnel rotation to and from the site. Project professionals from KAEFER’s companies throughout Europe flew in and out of central hubs on a scheduled air service throughout the contract period. Whatever the nature of the project, health and safety must be in focus. Systems must be established to capture undesired events. In 3 years, the Hammerfest LNG project had just three small incidents that resulted in lost working time, but no great danger. Proactive—and visible—management is another necessity. There is a big difference between being well informed and being told. Top management visited the Hammerfest LNG site at least once a month throughout the construction period. Dialogue with employees, clients, and other involved parties was critical. When prefabrication is involved, follow-up with all the different workshops involved is critical to ensure even quality and enable proper planning for piecing everything together based on the actual level of completion. Logistics should be improved, and there should be greater focus on weather protection during transportation to the building site. Everyone involved has good reason to be satisfied. The opportunities were there, and the challenges were obvious, but nothing was insurmountable. 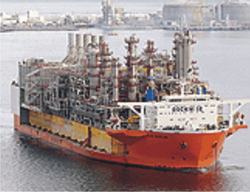 The Hammerfest LNG Plant started exporting to the United States in December 2007. 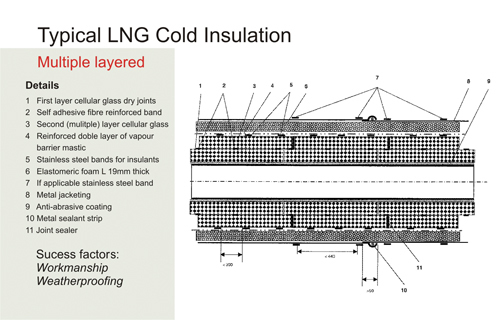 After 1 year of operation, no problems have been reported with the LNG insulation systems. 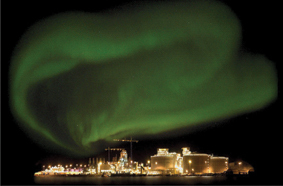 The Northern Lights in green over the illuminated LNG plant, one cold winter night. Arctic opportunities and challenges in exploration and production of oil and gas in the Arctic United States, Canada, and Russia. Overview of the construction site and the world’s northernmost city, Hammerfest. Typical winter weather at the site. The truck looks like an iceberg. LNG plant layout and the barge with the process plant built as the top side. Jigsaw puzzle: main fabrication yards and the sea routes from the prefabricated LNG plant to the construction site. The process plant arriving in Hammerfest on a heavy lift vessel from southern Spain, a voyage of more than 1,200 miles in rough waters. Heated weather protection houses built to withstand high wind speed and low temperatures. Heated weather protection houses provided climate-controlled workplaces for all trades on site during the construction period. 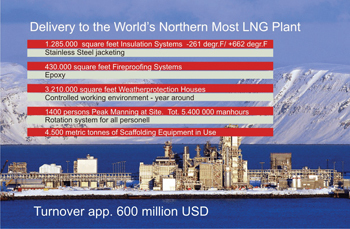 KAEFER’s main deliveries to the world’s northernmost LNG plant.